As we prepared to head out for the last net check of the day, Flo noticed this fellow clinging to a long-sleeved shirt she had hung on the back of her chair. The Eyed Click Beetle (Alaus oculatus) looks like it has two big eyes on an oversized head, but really, those are just spots on the thorax. Instead of tagging along for the last net check and helping take down the nets, I selfishly stayed behind in the hopes of watching the beetle demonstrate its unique behavior. I was punished for my selfishness. He never flipped for me. What a cool beetle. I’ve never seen one of these. 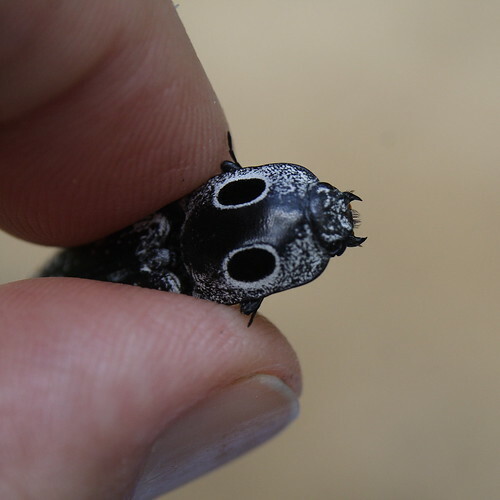 What a fascinating looking beetle. The eyespots are very cool. Pity he didn’t flip. These are very cool beetles – and BIG. I still remember when I saw my first one and was amazed by it. Nice series of shots. As far as I know, we don’t have those here in Hawaii, but I have seen them elsewhere. They’re really cool beetles – both in appearance and behavior. Your non-flipping model was probably recovering from the terror of being handled and photographed! hahaha.. it never flipped for you. 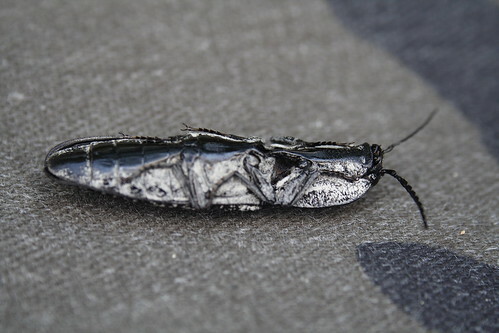 I live in Ky and my daughter found one of these in our yard….it was deceased but intrigued me. Very beautiful species. I live in Schuylkill county, Pennsylvania. Around 5 p.m. yesterday afternoon, my husband and I had a visit from 2 of these beetles. The first one flew at us while we were sitting under our patio. My husband swatted it and it fell to the ground. When he tried to move it, it “hopped” in the air . . . almost like a grass hopper. Then, it played “dead”. I ran in to get my camera, and took a few photos. I posted it to my Wall on Facebook; however, no one had ever seen it before. Then, this evening, a “friend” from Las Vegas gave me this website and voila, here it is. 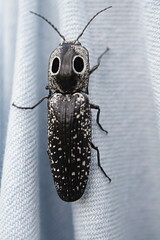 An “eyed click beetle” . . .
cool… the internet is so fascinating and can lead you to so many discoveries. i just love it. We found an eyed click beetle at Lake Tahoe. However, the descriptions of it say that its range is in the Eastern United States. Is there a California species? Just found one this evening! I’m in Richmond, Virginia. He flipped three times and scared the tar out of me. The flips were loud and high! So amazing. just found one in Chattanooga, Tennessee. I never seen one until today. love the continuing alert on this strange creature! My wife just found one on our back porch here in Starkville, Miss. They seem to tuck in their legs somehow, like a turtle, but it definitely can flip itself and does so when threatened. I found one yesterday clinging to my shirt hanging on the clothesline. What a beautiful specimen! This morning within 20 sec I was able to find this site and give it a name. The internet is amazing. I posted it on FB already hoping someone would tell me the name. Mine didn’t “click” which would have been pretty shocking since I had the camera inches above him. Saw one today in Virginia. First time for me. So had to look it up. Eyes on back look comical. had one at Quail Hollow CC in Charlotte, NC today. I’ve seen them as well in NJ but didn’t bother to look them up till now to find out what it was. Was an interesting find on a blazing hot NC day.